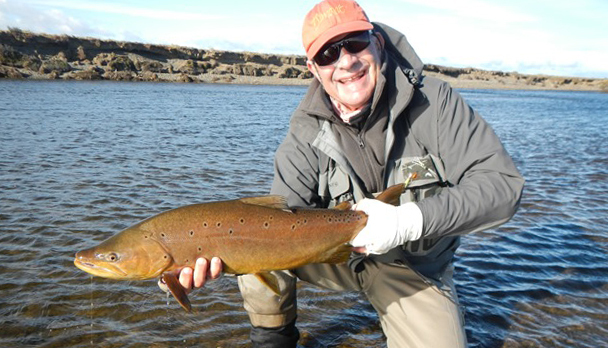 Located in Tierra del Fuego, Aurelia Lodge, is the only lodge with acces to both margins of the rivers; 9,5 Km over Río Grande and 25 Km of the Río Menendez. The migratory trouts "sea-run brown", after running a couple of times to spawn, can easily weight up to 20 pounds. The season starts in February and finishis at the end of April. The Rio Grande flows from west to east, it's born on the White Lake (Tierra del Fuego on the Chilean side) flowing to the Atlantic Ocean, with more than 160 km long and 70 Km of them in Argentine territory. The landscape of Tierra del Fuego is reminiscent of Wyoming or the Scottish Flow country. It is a sparsely populated wilderness. Large sheep farming Estancias share this land with herds of wild llama-like guanacos, grey foxes, beavers and condors. The success of the fishery on the Rio Grande is a modern-day fisherman's Cinderella story. In just a decade, through access control and the diligent promotion of catch and release, average catch results have risen remarkably. 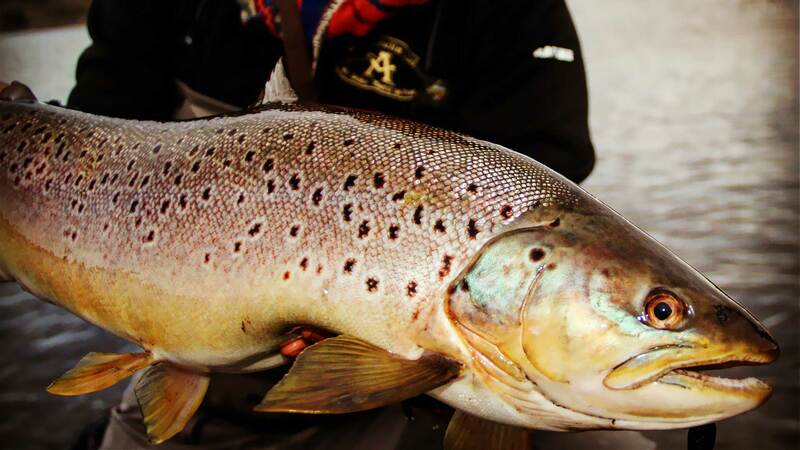 The first brown trout were stocked in Tierra del Fuego by John Goodall in 1935, and were planted on the Candelaria and McLennan Rivers, both tributaries of the Rio Grande. These fish eventually found their way to the sea, possibly attracted by the rich nourishment of the estuary. These sea-run brown trout now complete the yearly migratory cycle of salmonids, spawning during the summer months in freshwater. Salmo Trutta remains in the river for a period of time which ranges between 1 and 4 years until their first migration to the sea, where they will feed and grow for about 6 months before their first return to freshwater, weighing approximately 6 lbs. Researchers have found trout which had spawned more than 6 times. 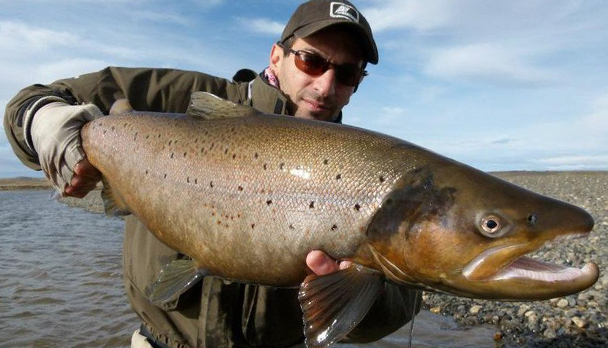 A trout that has completed 4 cycles of returning to freshwater can weigh over 20 lbs. The frequency with which they return to freshwater is also an indicator that the fish face very few threats. Whilst also providing a very real example of the benefits of Catch and Release. The fishing season begins February 1st and finishes April 30th every year. The program runs from one Saturday to the other; the lodge staff will receive you in the airport and transfer you to the lodge. There's no fishing during the first day, you'll prepare your equipment, get installed in the hotel room and have a meeting with the guides. Fishing is from Sunday to Friday, and on Saturday you'll be transferred back to the airport for the returning trip. A typical day: the guides will pick you up around 8 AM after breakfast each day, fishing until around 12 PM, always one guide every two anglers. Outstanding lunch will be served at the lodge or in the new full made comfortable river cabin, 10 minutes from the river, where you'll find a great place to relax visit the fly shop and enjoy the traditional siesta in spacious double rooms (the hours of which will depend on month of the season). Guests return to the river between 5 and 6 PM and fish until dusk. Once back in the lodge, the lodge chef will be waiting for you with a three-step dinner. The lodge also offers alternative programs for non-anglers, who would be able to enjoy horse riding, photo safaris, quad trips. Aurelia Lodge was specially made in 2005 over the traditional Rosita ranch house, totally renovated for conversion to a fishing lodge and guest will enjoy spacious rooms, large and appointed private bathrooms, warm and welcoming reception areas, a homely dinning room, bar area and traditional argentine barbeque area (quincho), a casual lounge with a pool table and fly-tying area all of which are very well furnished and heated. At the lodge they can comfortably accommodates 12 guests in 5 twin rooms, one of which is a very large suite ideal for families of up to 4 peoples, however, the number of rods may not exceed 8 licensed anglers per week. Aurelia offers wonderful cuisine based on local meats, fresh vegetable and delicious deserts. A traditional Asado (BBQ) will be held once during your stay, and you can sample different cuts of meat and wonderful salads. A full cooked breakfast will be available together with fresh fruits, yogurts, home baked breads and jams and a selection of cereals. They have a wonderful selection of exquisite fine wines from different famous wines cellar from Argentina, which will be served during dinner. Rod: For a single-handed rod #9, 9 ½ or 10 ft. for an 8 weight is ideal. Light two handed rods are increasingly popular and allow anglers to cast a comfortable line with less effort, particularly on windy days. We encourage you to bring one of 13 to 15 ft. for a 9-11 wt. line. Reel: A strong, smooth drag is a must. Reels should have capacity for the fly line and 150 yards of 20 lb backing. Lines: Anglers should include at least 3 or 4 lines to accommodate variance in water levels and wind conditions. Weight forward fly lines are generally used n the Rio Grande. A sinking shooting taper is very important. The Teeny T-200 and T-300 lines or Rio 24 ft Density Compensated Sinking Tip 200, 300 and 400 grs are excellent, and at least one or both of these lines should be considered as must bring items. Intermediate lines are also effective in some conditions. Floating lines are typically most useful in low water conditions and during early morning and evening hours, when sea trout are inclined to be nearer the surface. For two handed rods we find that a Rio Spey Lines Diversity Tips, Skagit model or equivalent is very versatile as these allow one to switch line weights from fast sinking #8 to medium #3 or floating lines easily; Furthermore Rio Big Boy type line tips in the 150 to 600 gr or T14 can be very useful for varying the length of the sinking tip being used. Leaders/Tippet: Spools of mono should include 20, 15, 12 and 10 lbs breaking strengths. We recommend straight Maxima for sinking line leaders and for floating have a knotless tapered leader from 9 to 12 ft with OX tippets. Also, take any large, dark trout or salmon fly in which you have confidence. Fishing a fly that has worked for you in the past, and in which you have confidence, is half the battle. Rates include: 7 night accommodation with all meals, beverages, wines and cocktails, 6 full fishing days, transfer round trip airport-lodge, internet access. Rates do not include: Personal insurance, fishing equipment and flies, fishing license, staff and guide gratuities.